On this day in 1863, the 54th Massachusetts Regiment paraded to the harbor and left for war. 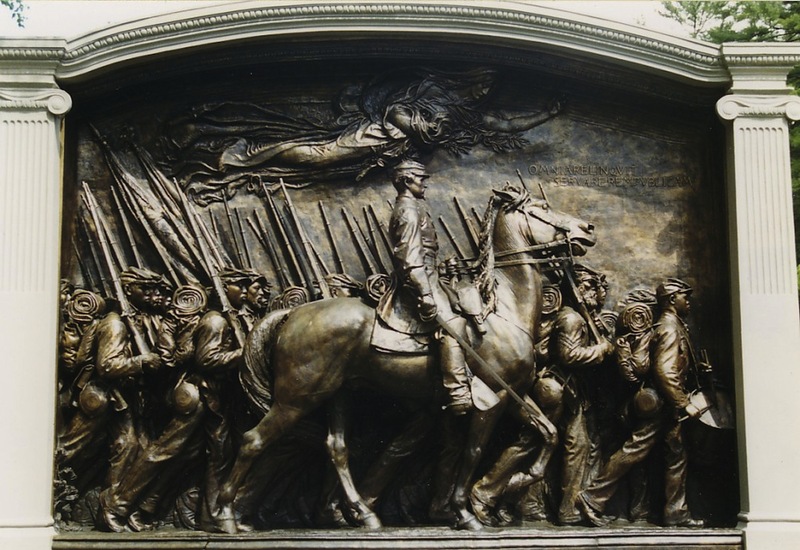 By Eric Randall·	 5/28/2015, 8:53 a.m.
Robert Gould Shaw Memorial via Wikimedia Commons. On this day in 1863, the people of Boston lined the streets to see the 54th Massachusetts Regiment parade to Battery Wharf and board steamships for South Carolina. For Boston citizens, there was unusual interest in seeing off this group of 1,000 or so soldiers. They formed the first regiment of black soldiers recruited during the Civil War. Despite many black mens’ interest in joining the fighting prior to that point, the Civil War’s armies had been restricted to white men. Only after President Abraham Lincoln issued the Emancipation Proclamation—and demand for men grew—did he consent to the recruitment of free black soldiers. Even then, he required they be led by white officers. Massachusetts Governor John A. Andrew was first to heed the call, forming the Massachusetts 54th Regiment and recruiting able and interested black men to serve. To lead the new soldiers, he chose Robert Gould Shaw, son of prominent abolitionists, as the commanding officer. As the group marched through the streets of Boston, they drew the eyes of many for whom the idea of black soldiers was entirely novel. Onlookers knew that the stakes were higher for this group, too. Any black soldier captured by the Confederates would be enslaved or killed. Later, when the War Department attempted to pay them less than they paid white soldiers, the group refused to accept, taking no pay until the government finally caved. Today, they are memorialized with the Robert Gould Shaw memorial statue across from the State House, pictured above.